Some of the characteristics used to identify your plant specimen may be unfamiliar to you. Please familiarize yourself with the glossary information below to assist in your search. Select the color that most closely resembles the color of your plant specimen. If you specimen has more than one color, first search by the predominant colors. For these reasons, try searching by other color possibilities if your search does not yield any species that match your specimen. Graminoid: a herbaceous moncotyledon that might be described as "grass-like". 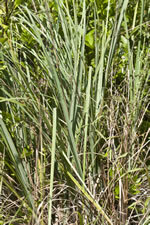 Graminoids include plants of the family Poaceae or true grasses, Cyperaceae or sedges, and Juncacea or rushes. Flowering plants or Angiosperms are the largest and most diverse group of plants. Angiosperms are divided into Monocots and Dicots. Monocots have one seed leaf and Dicots have 2 seed leaves. Flower parts (sepals, petals, stamens) usually in multiples of 3's. Major leaf veins usually in parallel arrangement. Flower parts usually in multiples of 4's or 5's. Major leaf veins usually in netted or reticulated arrangement. Copyright© 2019 John R. Gwaltney. All rights reserved.